WHO: Novice drivers through instructors from the US and Canada who want to increase their skill level in HPDE diving using their own cars on one of the world’s best road course venues. YOU MUST BE AT LEAST 18 YEARS OLD TO DRIVE IN THIS EVENT. SUNDAY, MAY 19: Registration and vehicle tech along with a light dinner and cash bar will held at the home of our featured sponsor Throttlestop in Elkhart Lake. A tour of their new facility will be available as well. 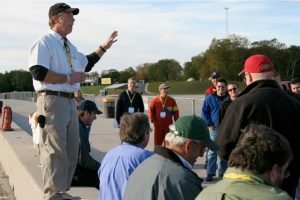 A driver and instructor meeting is scheduled for 6:00 PM at Throttlestop. Road America is a four mile road course opened in 1950 which features 14 turns, three fast straights and challenging features such as The Kink and The Carousel. 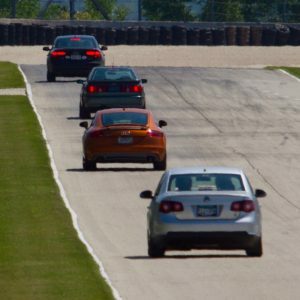 Road and Track magazine has named Road America one of the top race tracks in North America. In 2018 they said “ Some people still call Road America the center of road racing in North America. It has everything that makes up a great track, like elevation change, long straights, variety of corner types and amazing scenery. ” This is a course that should be on your bucket list! Audi Club membership is required for instructors. If you are an instructor but not an Audi Club member go to the national club website audiclubna.org or call 262-567-5476 to join. The cost is $49 per year. This can be paid by credit card. You will need your Audi Club membership number to complete the registration process. Students who are not Audi Club members will be assessed an additional fee that will be used to buy them an Audi Club membership. All brands of car are welcome, you don’t need an Audi to participate! 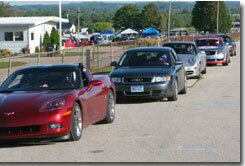 Select SUV’s are also welcome in the Novice class! See details on the registration website. Fees are only payable online only with your credit card when you register. See registration form for details. IT’S HAPPY HOUR TIME AGAIN! !